These are the most frequently asked General and Cosmetic Dentistry questions. If you’d like more information than is covered here, please contact us. We use our first appointment to familiarize ourselves with you and your dental health. Prior to this first appointment we have no way of knowing what condition your mouth is in and cannot schedule the appropriate type of cleaning to get your teeth and gums healthy and clean. We will perform a detailed examination of your teeth, gum tissues, head and neck and determine what, if any, procedures are required to get you to an optimal state of dental health. Do I need to get x-rays at my first appointment and how often do I get them? X-rays are an integral part of our dental examination. The American Dental Association recommends cavity finding bitewing x-rays once a year, and a set of full mouth x-rays (18 x-rays) every 3 years. In order for us to provide you with a complete and thorough examination we will take x-rays at your comprehensive new patient evaluation. If you have recent x-rays we ask that you acquire a copy of them prior to your appointment with us and bring them with you (or have them sent to us). Why do I need a set of full mouth x-rays if I have already had a panoramic x-ray taken? Full mouth x-rays provide very detailed information about the condition of the teeth and bone surrounding the teeth. Panoramic x-rays are good at showing the overall health of the jaw bones (especially good for wisdom teeth) but are not useful for diagnosing cavities or bone loss from gum/periodontal disease. Why do I need bitewing x-rays yearly? These x-rays allow us to see between your teeth where most cavities in adults start. 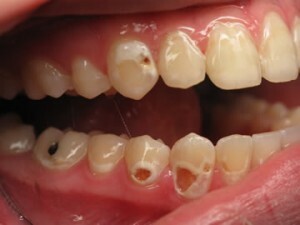 Until these cavities get large they are not visible to the naked eye. Allowing us to diagnose those cavities early, means early treatment. 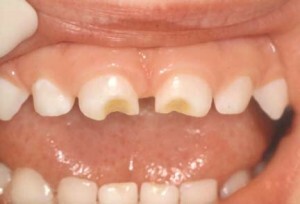 The earlier we remove a cavity, the less tooth structure must be removed, thus the stronger your tooth will be. Why are there so many x-rays in a full mouth series? 18 x-rays are necessary to capture all of the detail required to make a full and complete radiographic diagnosis of your teeth and supporting bone. The only exception is a person that may be missing several teeth. For a person missing most or all of their teeth, we utilize a Panoramic x-ray. What is the difference between an assistant and a hygienist? An assistant is trained to assist the doctor performing dental procedures on a patient. Some tasks can be performed solely by a dental assistant. A dental hygienist has been educated in the art and treatment of dental prophylaxis (professional teeth cleaning) and periodontal therapy. Hygienists must attend at least a two year program to receive a RDH license to practice in the state of New Hampshire. How long will I be numb for after my dental procedure? In general (although it can vary greatly from person to person) you can expect to be numb for about 1.5 hours on your upper jaw, and 2-3 hours on your lower jaw. During this time it is very important you are very careful not to injure yourself should you attempt to eat. Dental insurance was not intended to cover the costs of all your dental needs. Every plan is different; some participants will be covered on a percentage basis and some based on fee-schedule limits and annual maximums. As a courtesy we will help try to get you a realistic estimate of what we feel your insurance company will pay towards your dental care. However, it is your plan, and ultimately your responsibility for reading and understanding what your plan covers and what its limitations are. If you have questions we suggest you contact either your insurance company or your employer. Should dental treatment decisions be based on what my insurance will pay? People often make treatment decisions solely based on what their insurance will cover, assuming that their insurance will cover all costs associated with their oral healthcare. Unfortunately, this is usually not the case. Each individual’s dental needs are different and unique. Once we have examined you and discussed the treatment options that are best suited to your overall needs, then you should consider your insurance coverage and its limits and/or constraints. Am I responsible for paying if my insurance company fails to pay? Ultimately you are responsible for paying the entire portion of your dental bill if your insurance fails to pay. We work for you, not your insurance company, and are not responsible for provisions in your insurance policy. We will assist you by submitting all of the required paperwork and information to help get your claim processed but cannot guarantee the insurance company will pay all or a portion of the claim. Cosmetic Dentistry is a discipline within dentistry in which the primary focus is the modification of appearance of a patient’s teeth and soft tissue. Teeth can be treated with procedures such as whitening, porcelain veneers, porcelains crowns, and soft tissue (gum) recontouring to give the teeth the appearance of a natural, healthy, “ideal” smile. We try to educate our patients on the best ways to keep their teeth healthy. Brushing, flossing and seeing the dentist regularly are very important to good oral health, but it goes further than that. Diet also plays a big role in keeping your teeth healthy. Unfortunately, drinking carbonated soft drinks on a regular basis has become a way of life for many people in our country. The average American consumes 45 gallons of soft drinks per year! Many people are unaware of just how bad carbonated sodas are for their teeth. Drinking sports drinks and carbonated sodas can do immense damage to tooth structure and lead to serious decay problems. Carbonated soda contains large amounts of sugar-some contain over 11 teaspoons of sugar per 12 oz can! A 20 ounce bottle of Mountain Dew actually contains 19 teaspoons of sugar!! It’s not just the sugar content that is dangerous, however. Carbonated drinks also contain acids that eat away at the enamel of the teeth and make a person more prone to decay and dental enamel erosion. People like students who tend to sip on soda throughout the course of a day and/or night while studying are at extreme risk for dental decay. “Sip all day-get decay” refers to the fact that when soda is consumed over a long period of time, your teeth are actually being bathed in acid over an extended period of time. Not to mention the fact that sugar in the soda is also converted to acid by the bacteria in the mouth, so together, that’s a good recipe for dental destruction! Though some people may think that diet carbonated sodas are better because they don’t contain sugar, they should know that diet sodas still contain the same acids that can do serious damage. People who think it’s safe to drink diet sodas throughout the day and between meals because they have no calories should know that the “Sip all day-get decay” scenario applies to them as well. It’s not just children or students who are at risk, but adults as well. If you must drink soda, it would be much better to limit it to once per day and drink it with a meal to reduce your exposure to sugar and acids. When finished eating, rinse your mouth with water first to neutralize the acids, then brush with fluoride toothpaste and rinse with water. Brushing your teeth in a high acid environment will erode tooth enamel. Maybe Sports Drinks Would Be Better For Me To Drink? Many people equate sports drinks with fitness, and assume that they must be a healthy choice when exercising or extremely thirsty. This may not be the best assumption to make. 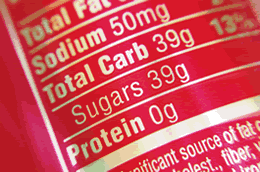 Like carbonated sodas, sports drinks also contain a high level of sugar. Gatorade and Powerade, for example, contain as much as two-thirds the sugar in carbonated sodas! Besides the damage caused to teeth from sugar, sports drinks, lemonade, energy drinks, fitness water and iced tea can actually cause irreversible damage (erosion) to dental enamel due to organic acids and additives contained in the sports drinks. Enamel is the thin, outer layer of hard tissue that helps maintain the tooth structure and shape, while protecting it from decay. The organic acids are very erosive to the dental enamel because they actually break down calcium, which is necessary to strengthen teeth and prevent gum disease. Studies have revealed that enamel damage caused by non-carbonated drinks and sports drinks was three to eleven times greater than carbonated sodas. Energy drinks and bottled lemonades were shown to cause the most harm to dental enamel. When extremely thirsty, the best thing you could do is to drink regular water. 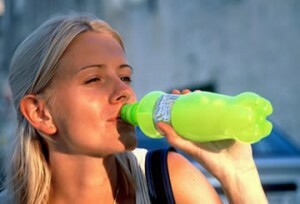 When you are thirsty or dehydrated, your saliva level is lower than usual. Your saliva helps to naturally neutralize the acids in your mouth, therefore helping to reduce decay. If you are extremely thirsty and drink a sports drink, soda or bottled lemonade that is high in sugar and acid, your teeth are at a much greater risk for decay. If your saliva level is low, it will be difficult to neutralize the acids in the mouth. So, think of water first when your mouth is very dry and you are very thirsty-it really is your best choice for oral and physical well-being! Fruit Juices Must Be Good For My Children, Right? Decay can be caused by being put to bed with bottles of juice or milk. We know that as a parent you want to make the best choices for your children in order to ensure they eat right, stay healthy and have healthy teeth. You may be surprised to learn that giving your children fruit juice can actually do a lot more harm than good. Fruit juices, even ones that are labeled “ALL NATURAL”, or “ORGANIC”, contain sugar, which, as we’ve discussed before, causes serious decay. The decay problems that we see in our office are caused by fruit juices more than any other cause. Parents who are aware of the sugar in the juice and the risk for decay from that sugar sometimes think if they add water to the juice it will reduce the risk. This is actually incorrect. Even if juice were to be watered to a ratio of 10 to 1, it would still be just as dangerous. The sugar is still there, and there is still enough of it to get into every crack and crevice in your child’s teeth and can cause massive decay. Children who are put to bed with bottles of juice are sure to have decay problems at a very young age. Bottles of milk at bedtime are just as detrimental to your child’s oral health. There are natural sugars in milk and fruit juice that will pool around the teeth while a child sleeps. When children sleep, their saliva flow is reduced, which does not allow for those sugars and acids to be washed away. The best practice is to not use a bottle at bedtime. If a bottle must be used at bedtime until the habit can be broken, only use fresh, unflavored, natural water in the bottle or sippy cup. We hope this information will help you to maintain optimal oral health. Please feel free to ask our doctors or staff members any questions you have regarding this subject. We truly want to help you maintain the best oral and physical health possible!